The latest chess news via Fide is about the opening ceremony of the Asian Zone 3.3 Chess Championship that has begun in Tagaytay City. The Philippines' top chess player, GM Wesley So (2682), had a good start in the Asian Zone 3.3 Chess Championship at the Tagaytay International Convention Center in Tagaytay City. 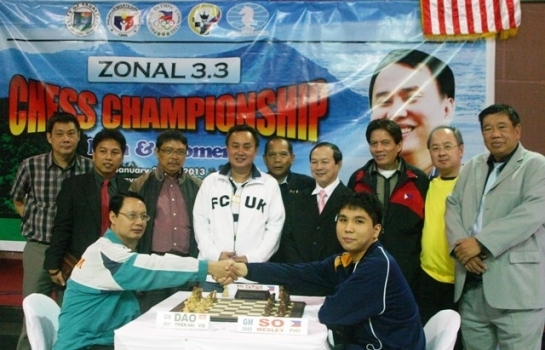 The 19-year-old Bacoor, Cavite native, the country's highest-ranked player and the tournament’s top seed with an Elo rating of 2682, took a break from his studies at Webster University in the United States to compete in the event hosted by Tagaytay City Mayor Abraham “Bambol” Tolentino Jr. and the city council So beat Rustum Tolentino of Cagayan de Oro City (ELO 2364) after 28 moves from the white side of a Queens Pawn Game. In other matches, second seed GM Nguyen Ngoc Truongson (2631) of Vietnam beat FM Rudin Hamdani of Indonesia in 49 moves of a French Defense. US based GM Rogelio 'Banjo' Barcenilla Jr. (ELO 2483) defeated NM Rolando Andador of Talisay, Negros Occidental (ELO 2326) after 53 moves of Slav defense. Surprises of the opening round were the strong showing of 13-year-old Yeoh Li Thian of Malaysia who held GM John Paul Gomez of the Philippines to a draw after 51 moves of Slav duel, and the draw by FM Paulo Bersamina of the Philippines (2206) vs GM Cao Sang of Vietnam (2488). Unheralded Ben Palao of the Philippines (2091) upset GM Richard Bitoon of Cebu, Philippines (2411) in 47 moves of a Sicilian defense. The Women's zonal has 18 players from four countries vying for the single slot for the Women's World Championship.